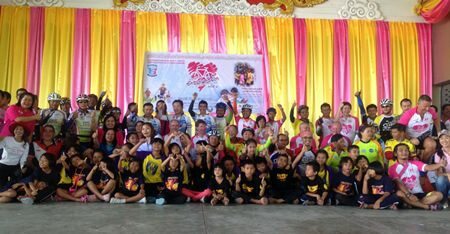 Nongprue officials and Racerg.net raised 210,000 baht for orphans with the 4th annual Ban Jing Jai bicycle race. The Nov. 22 event aimed to promote cycling as the way to exercise, reduce pollution from automobiles and save energy. Its objective was also to raise money for daily expenses and education of children at the Ban Jing Jai orphanage. 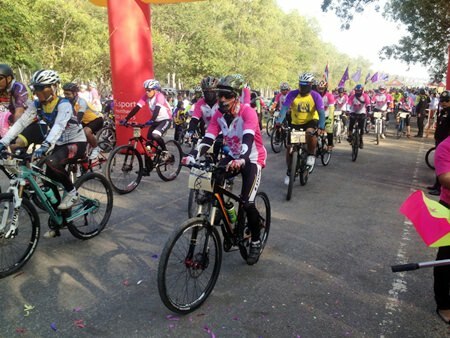 Nongprue Mayor Mai Chaiyanit kicked off the event with more than 400 cyclists riding around Mabprachan Reservoir and ending at the Nongprue municipal office. Cyclists make their way around Mabprachan Reservoir to raise money for Ban Jing Jai. Ban Jing Jai Foundation Director Piangta Chumnoi said the event not only raises money for the orphanage, but makes it better known to the public. The foundation also wants to raise awareness about cycling as a means of transport in daily life to reduce global warming. There were no winners, as the emphasis was on fun, exercise and charity. Entry tickets were sold at 300 baht for the public and 1,000 baht for VIPs. Profits from the ride were distributed to care for the more than 50 kids at the home.